Patience is a virtue hard to find nowadays: manifold is the information from all over the world that competes for our attention, and there are just too many tasks on a busy daily schedule that need to get done. It is, however, a virtue worth striving for, because it can reduce a lot of stress in life by fostering a healthy imperturbability, while at the same time helping to determine when the right time for action has come. Keron Salmon, better known as Kabaka Pyramid, definitely has patiently waited for the perfect moment. After a cover-feature on the current issue of Riddim Magazine, performances at some of Europe's biggest Reggae festivals and a congenial appearance in Reggaeville's Wha' Gwaan Munchy?! ?, his name is on everyone's lips. Not completely unknown to German ears due to the release of High & Windy with local artist Sara Lugo and a few club-gigs in 2012, this year gave us a fresh chance to experience the rising artists live on stage. 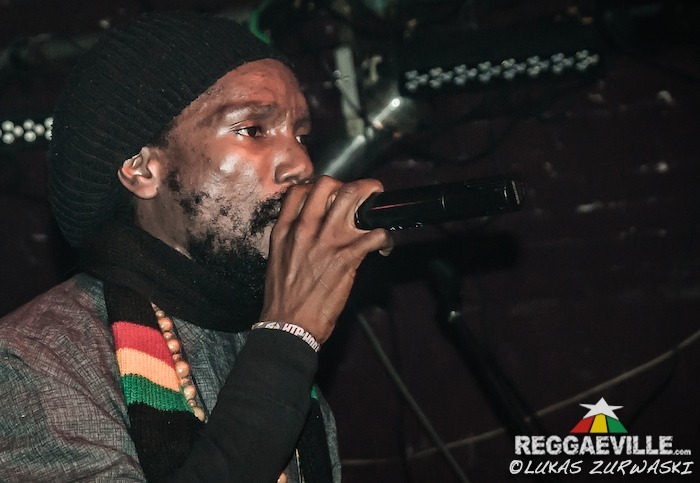 One of his two only appearances in Germany - after having sufficiently impressed the crowd at Chiemsee Reggae Summer - brought the artist to Hamburg last Saturday. Soon after opening, the location Waagenbau was filling up quickly, and around 150 people enjoyed the spicy warm-up by Selekta Schepper. During the next two hours, their number had almost doubled, a fact that bore proof both of Kabaka's popularity and the people's willingness to forgive promoter Inna Di Dance's vain attempt to bring Elephant Man to Hamburg two weeks ago (which, as those who followed the story will agree, wasn't really his fault). At 2:15am, the waiting crowd stirred expectantly when movement behind the DJ-desks indicated imminent action. And indeed, right after manager Abishai Hoilett had welcomed each and everyone present, a ringing voice from off stage started to announce the Rebel Music that gave his present tour its name. To the sounds of Lead The Way, Kabaka Pyramid finally appeared in the spotlight and started to deluge the place with words. Introducing himself in Free From Chains, the first round of lighters lit up on the track Liberal Opposer when the artist told us "I want you to listen to the lyrics!". And that's what you have to do, because honestly, this young man has more lyrics in one song than others have on a whole album! What is more, his textual output is not depending on overused phrases or shoobidoos and shalalas, but represents fresh and pure consciousness! The teaching of the songs War, Crime & Violence and No Capitalist was serious, criticizing governments and commercialism all over the world and encouraging participation: "This is a political statement. Where is your lighter?". Of course, love has its place in Kabaka's music as well, as the following minutes showed. 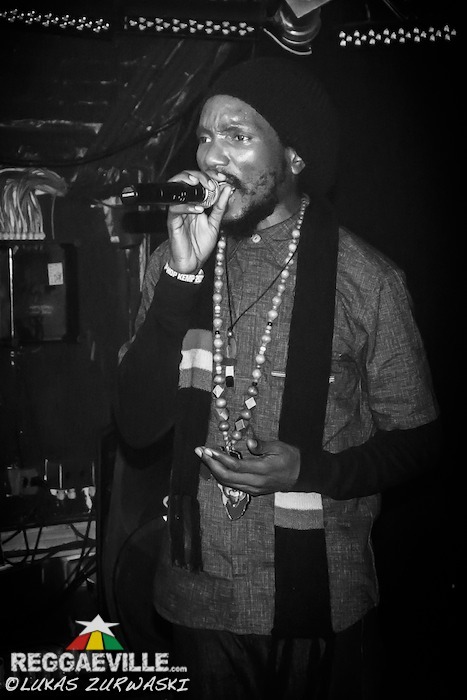 In Worldwide Love (on the riddim of the same name), he told us to "put away with the hate and the greed" because "we are one human race, many different colours, many hues & shades" and made the crowd sing along with hands raised high, while I Alone is a lady's tune that was accordingly received by the female listeners. Introduced as "a special song and a very personal tune", Cyaa Study Me deserved the first pull-up of the show - rightfully so, since this is one of the recently released tracks that consolidate the much-trumpeted Roots Reggae Revival. From there to HipHop seems like a far stretch, but with The Sound he captured the massive and really mashed up the place, giving it up for his pals Protoje and Chronixx before proceeding to Foundation. In full swing by now, the singer had visibly warmed up and flashed his contagious smile to the people ever so often, creating a warm atmosphere in which obviously everyone was having a good time. In this moment it could be felt that the insignia he wears is not only empty decoration, but a meaningful part of his powerful personality. But back to the show… The tune King Kabaka got a big reaction from the crowd as well, again with lyrics so intense that you'd wish to have a printout to read along, in order not to miss a single word of what he has to say. After Feel Di Vibes and Ready Fi Di Road, the singer handed back the mic to his manager and left stage, not without being called back immediately by the audience. Three more songs concluded this impressive show, one of which (Warriors) abducted us to Africa with rolling drums. Actually, it is here that Keron found the inspiration for his nom de plume: the ancient and mysterious pyramids in Egypt need no further explanation; Kabaka is the title of the physical king of the Buganda Empire. There is a spiritual king as well called Mujaguzo, represented by the Royal Drums - with this, we have come full circle back to the music! After one hour of acute performance, the artist passed his final farewell to the people, who danced the rest of the night away to the soundset of DJ Dynamite. Asked what we can expect in the near future, Kabaka heralded the release of a compilation called Lead the Way later this year. It will certainly be worth waiting for, and one can safely follow the advice included in the title and let him and his words lead our way. This night was an experience running deeper than just going out and party - thanx for the input, Kabaka Pyramid! And here's another flash: the next time things don't work out or people make you lose your nerves, take a step back, breathe deeply and give the universe some time to unravel the strings of fortune for you. Patience works!